I’ve had a stainless Ultra Carry for a couple of months now with about 1000 rounds through it so far. I may not be the best source for a review as I believe I may have been expecting a bit too much of the gun but here goes. I had the gun give up on me a couple of days into a three day class. I can’t really blame the gun for everything however as the conditions were very dusty and the mags caused most of the problem. However, the gun was chewing up some of the brass at the 6 o’clock position. I did a judicious amount of polishing on the breech face and the frame feed ramp. I also radiused the transition area between the barrel feed ramp and the beginning of the chamber. I believe this was where the problem was. After shooting 200 rounds Wednesday, all of the brass was undamaged and only about 10 of them had any marks at all at the 6 o’clock position. I had one jam that was due to the cartridge. The short version is that the problem seems to have been solved. I still want to put several hundred jam-free rounds through it before I start carrying it. The factory magazine (a Mec-gar I believe) had a floor plate that was too long. When locked into the gun, the front of the floor plate would extend past the frame about a tenth of an inch and rub against my little finger. A couple of hundred rounds would leave a blister. I took care of that with a file and now it’s fine. As I said before, I expected a bit more than I got in the gun. The interior of the slide is much rougher than the slide on my Colt series 70 and is more difficult to clean. The jamming problems had me upset with it for a while but it seems I managed to take care of that on my own. Now for the good parts. It shoots very accurately despite the short barrel, although the sights were off by a good bit as received from the factory. I’m going to replace the sights with some with tritium inserts before I begin carrying it full time. The trigger, as it came from the factory, was absolutely wonderful. Very little take-up, no creep whatsoever and a crisp break. All I did to it was adjust the trigger over-travel screw to give it the best trigger on any gun I own. When I detail stripped the gun and lubed the trigger group with TW25B, the trigger got even better. In fact, it might be a little too light now. Recoil with standard ammo is a no problem at all and is much better than I expected it to be. I did decide after 20 rounds of Corbon 200 grain +P to stay away from that however. The recoil was violent and more than I could comfortably handle in a carry gun. I intend for the gun to be my primary carry as soon as I gain enough confidence in it. I know that most people recommend a 500 round break-in period for any gun but this one seems to have needed 750 to 1000 and a few minor manual modifications. The only holster I have for the gun so far is a Dillon Cactus League Belt Slide that I bought for the class. 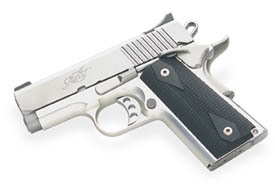 I worked wonderfully, will fit both the Ultra Carry and my Colt, and was inexpensive to boot.